The Metrologic Voyager Series offers high performance scanning, a futuristic design and a more intuitive scanning system than other scanners. Choose the Voyager Series for the extensive connectivity options, the ease-of-use friendly to both beginners and experienced users, the sturdy construction, the variety of programming options and more! SCANNER ONLY, 1D Laser, Cordless. Cables and accessories must be purchased separately. These include USB (Part# 52-52828A-3-RW), PS/2 (Part# 53-530002B), or RS-232 Serial cables (Part# 53-53000B-N-3), Power supply (Part# 46-46880) and a Charging/Communications cradle (Part# MI9535-538). Color: Black. SCANNER ONLY, 1D Laser, Cordless. Cables and accessories must be purchased separately. These include USB (Part# 52-52828A-3-RW), PS/2 (Part# 53-530002B), or RS-232 Serial cables (Part# 53-53000B-N-3), Power supply (Part# 46-46880) and a Charging/Communications cradle (Part# MI9535-538). Color: White. Keyboard wedge kit. Includes PDF417 scanner, PS/2 cable, stand, CodeGate & manual. Color: white. RS-232 Kit, 1D Laser. Includes RS-232 cable and mask stand. Color: White. Non-Cancelable/Non-Returnable. PS/2 kit, 1D Laser. Includes PS/2 cable, power supply, and stand. Color: Gray. Non-Cancelable/Non-Returnable. RS-232 kit, 1D Laser. Includes RS-232 cable, power supply, and stand. Color: Gray. USB kit, 1D Laser. Includes USB cable and stand. Color: Gray. PS/2 Kit 1D Laser. Includes PS/2 cable and stand. Color: Black. RS-232 kit, 1D Laser. Includes RS-232 cable, power supply, and stand. Color: Black. International USB kit, 1D Laser, Cordless. Includes scanner, cradle, USB cradle to host cable, 220V power supply, and battery. Color: White. PS/2 kit, 1D Laser, Cordless, Expanded Memory. Includes scanner, cradle, PS/2 cradle to host cable, power supply, and battery. Color: White. USB kit, 1D Laser, Cordless, Expanded Memory. 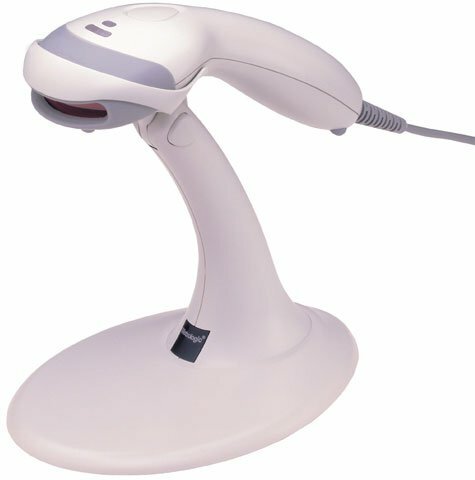 Includes scanner, cradle, RS-232 cradle to host cable, power supply, and battery. Color: White. RS-232 kit, 1D Laser, Cordless, Expanded Memory. Includes scanner, cradle, RS-232 cradle to host cable, power supply, and battery. Color: White. Easy to add to your register. Good fast service fast turn around. Business Fast to tead pricing code. Was looking for a basic scanner that wasn't too expensive but the MS9540 really surprised me how well it scanned compared to my previous scanner. Well worth the upgrade! These Metrologic scanners last for many years. The only reason you'll replace one is when the PC plug interface becomes obsolete. They are truly plug & play with automatic recognition of barcode type; no programming required. I purchased one of these because I got tired of the cord on the old one. I purchased an optical wireless scanner, but it would not read most barcodes. So, I got this one because it is laser. It has a range in the store of about 50 feet. I can take it around the store, do inventory, ring up transactions, and receive items. It was definitely worth the cost! We had purchased 80 of these units back in 2006 and all but one are still in use today. Very reliable. We needed additional units so we bought more. I highly recommend these scanners. I love that I don't have to squeeze the trigger to get it to scan. I accidentally purchased that type and it was a pain. This sits in the stand and you simply wave the barcode underneath. Brilliant! We use this product to scan key tags for check-in to events. It works great. The computer I used the scanner with had no problem finding the drivers, and it worked within seconds of plugging it in. We use these scanners throughout our operations area. Picking uses them to recall orders to trigger printing of pick tickets. Our QC area uses an application to recall an order to verify that correct picking has been completed. Our packers scan the order as it is being packed to update the order status as it is processing through the operations. These scanners have been very reliable and consistent in our day to day operations where we process over 900 orders per day. We have been using these scanners in our international conferences and it works great, reading barcodes even when the printing is not clear enough. A good product at a geat price with awesome customer service and quick delivery. Recommend this site and product to everyone. I called to get some explanation of the different barcode scanners we were looking at and the guy was very helpful. The order came when expected, we plugged it in, and it started working immediately. We have had no problems, and are very relieved that there was not a lot of techno mumbo-jumbo to read and figure out. It works great and we are very happy.